“I am from New York where it gets really, really cold and to come here in the warmth of the islands; it’s the best feeling in the world,” said Mr Johnson. He further commented that he will definitely be coming back and recommend that his friends visit as well. 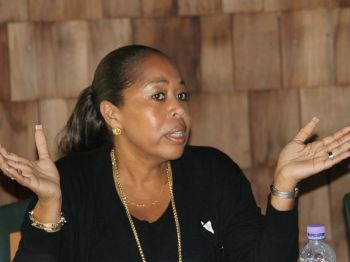 Speaking with Maria M. Lewis, another tourist pointed out that she has been vacationing in the Virgin Islands for the past three years, noting that she might have to take up residency in the territory. She further stated that she admires the culture of the Virgin Islands and she especially loves to eat Johnny cakes and chicken. Ms Lewis also told our news reporter that she likes to drink local drinks such as tamarind, mauby, passion fruit and soursop. Virgin Gorda and Jost Van Dyke were featured on the list of 'Top Islands in the Caribbean'. Virgin Gorda was ranked at number four, while Jost Van Dyke was at number ten. In addition, Guana Island earned the number nine spot on the list of Top 25 Resort Hotels which offers guests private island luxury and six pristine beaches. Fake news this cant be true! @hush!!!. Enough of your snide remarks. One who says that another person isn't from here, clearly tells others that you yourself aren't from here either. @"Cougar XR-7", I said that to say that it's people that make those type of comments are usually the ones who are living here and have no real interest in this country other than what they can do to fill their pockets... They always call down the country and compare the BVI to where they come from. They never have anything positive to say about this lovely place! And all this without a new airport or big fancy concrete hotels and things people THINK that tourists want. There have been many awards given VI over the past years because like one visitor says, they like the "authentic experience" of eating johnny cakes, the natural environment etc. Looking like Miami, Dubai, PR, or anyplace generic, will only chase those looking for peace and quiet away. If it ain't broken don't fix it. What can be done is upgrade wifi, clean brush and trash, cheaper groceries, keep beaches clean and empty- not vendors for a mall on the beach. People don't go to the beach to shop. This is proof. (too bad daily quality of life is challenged by cruise ship crowds at times). You are so right! Nobody needs big Hotels and Shopping Mails in the bvi. Or a big Airport. Thats how jobs are created. Stop being a short sighted tree hugger. The road to south sound is still closed. Costing the villa owners lots of cash since we cannot rent. I cannot believe that the comment to the Director of Tourism(To Ms. Flax-Brutus) garnered 21 dislikes! These freaking people are so full of hate and negativity that they jump at every opportunity to spew it. Like you all haven't changed after the devastation of last week. Go ahead people, God is looking on and taking note. If its one thing I would welcome is when the Minister of Education censor the media and stop all of this blogging. Our country needs HEALING people, "Who got glass house don't throw stones." "When you see your neighbor house on fire you wet yours." " When the rain falls it don't fall on one man's house just remember that." Splendid recognition of the VI brand by the US News and World Report for being one of the top vacation spots. Aditionally, the personal, positive feedback from visitors is priceless; it is the best form of advertising. The unspoiled environment and noncrowding experience is a major draw. To maintain and sustain its brand, it (BVI) must invest in and maintain its infrastructure, i.e., water, sewage, electricity, road, drainage, telecommunication, transportation( ferry); improve service delivery, expand and improve attractions, increase on-shore entertainment, put more heads in beds, arrest rising crime, pursue quality, not necessarily quantity; increase availability of local products, protect and preserve environmental resources.........etc.